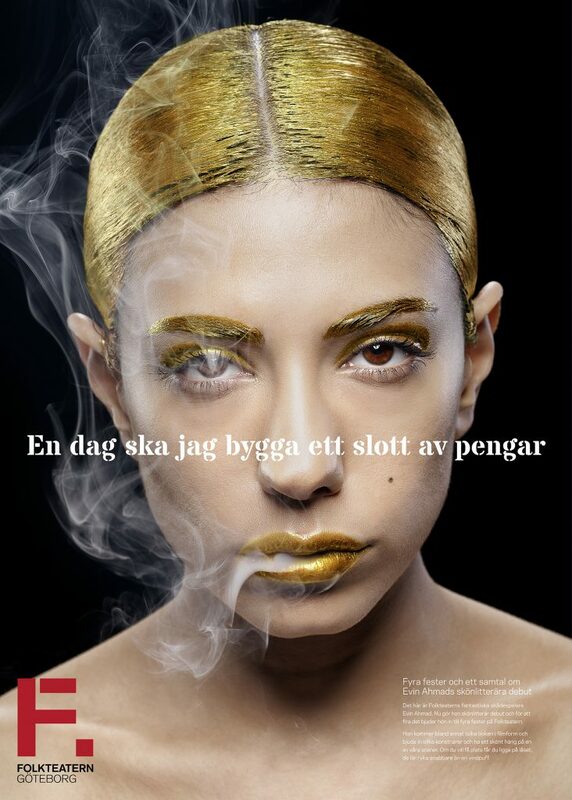 At the start of every new season at Folkteatern, Valentin&Byhr has the great pleasure to market the plays. In 2017 we did it with gold and stifling color. The work gave us the Swedish Design Award. Our mission for the theater is to lower the threshold for people to visit the theater. That is why we've chosen an easily accessible and poppy expression that is especially attractive to a new and young audience. Whenever we interpret the plays visually and verbally, we want to provide an introduction to the play, the first step into the amazing world of Folkeatern. Read more about our concept On Folkteatern's mind and how we enter the mind of Folkteatern. During 2017 we worked exclusively together with the photographer Jonatan Fernström. And the work gave us the Swedish Design Award. The jury's motivation was as follows: "For a challenging visual and verbal presentation that celebrates a strong and personal tone-of-voice." 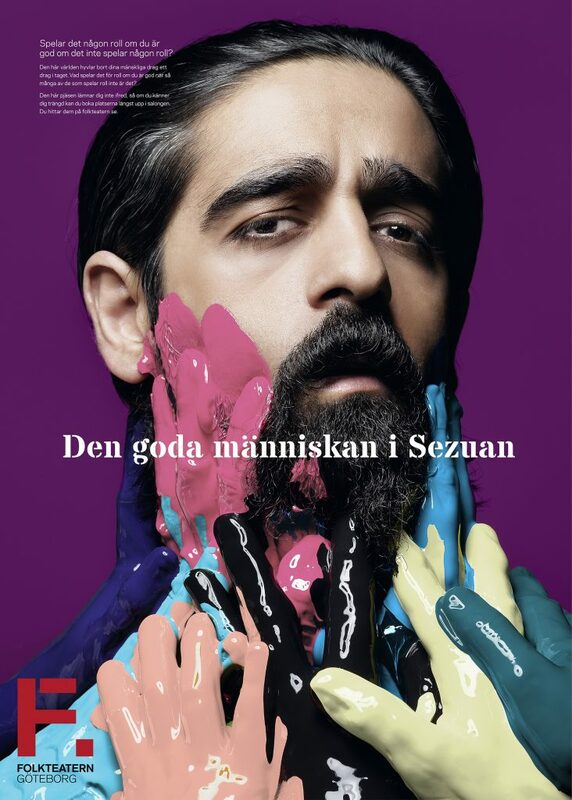 It was our work with two of the 2017 plays that resulted in the Swedish Design Award, and this was number one: One day I'll build a castle of money, which is Evin Ahmad's (actor at Folkteatern) debut as an author. During her book release at Folkteatern, she hosted a show where she interpreted the book in moving picture and invited guests to discuss the themes in the book. The book works with strong contrasts, portraying life in the suburbs at the end of the subway lines to the inner city where people participate in breathing exercises at stage schools. The main character, who is fictional but reminiscent of Evin himself, makes it to the red carpet and with a hell of an attitude – all of which we wanted this image to convey. The second play that led to the award was The Good Person of Szechwan. It is about a good hearted human being who is given a tobacco store by a pair of gods as she is the only good person they can find. In the tobacco store, she helps out people in need and eventually they are all fighting for her kindness. A bit into the play she dresses up as her male cousin and turns from good to evil. But the image is from the play's defining moment when everything hangs in the balance. Should she remain good or save herself by turning evil? We wanted to illustrate how she is about to be dragged down, how her pursuit of goodness becomes more and more suffocating by everyone she needs to rescue.